Pure is stoked, on this rainy evening, to put the newest waterproof jackets from Quiksilver onto the sales floor. "Incredible functionality, awesome style. This is a must have jacket for everyone's closet." Robby Roberts, owner, Pure. Pure has just stocked the new Moon Pack jacket from Quiksilver's Mountain Division. This 5K (5,000mm of waterproofing) comes in a dark royal blue and a clay colorway. A lightweight jacket with taped seams, this is an excellent street piece for the unexpected as well as the expected rainfall. "The perfect adventure jacket. 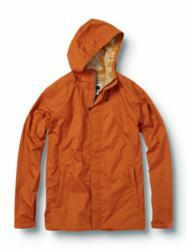 Whether exploring the Oregon Coast or driving to Baja, this jacket meets any explorer's needs." "Clean functional design and 5k waterproof breathable ripstop keeps adventurers dry." Clean functional design and 5K waterproof breathable ripstop keep you dry making this lightweight jacket the prefect adventure jacket. Fully taped 2.5L shell great for spring hikes, or layered over a puffy on super cold days. Pure Board Shop opened its doors on May of 2005. Its ease of access and parking make it a destination shop for riders and urban street ware fans alike. With their mix of products and variety in skate, snowboard , surf and exclusive streetwear and shoe brands Pure’s customers extend far beyond their Annapolis location. Pure prides itself on making customer service its number one priority, with product knowledge and having the right product mix a close second. The store and the website feature an ever growing brand inventory such as Nike SB Dunk, Nike Snowboarding, Lib Tech snowboarding, Adidas skateboarding, Vans, Levis Skateboarding, Diamond, HUF, LRG, Neff, RVCA and The Hundreds, as well as a large selection of Sunglasses and other accessories. The shop also prides itself on having the largest inventory of longboard equipment in the area; with brands like Land Yachtz, Rayne, Caliber, Cult, RAD, Abec11 and many more. Pure puts on monthly skateboard jams/events in their local skateboard park as well as sponsors many longboard slide jams and races in the DC Metro Area. Also, Pure's new website will be up and running very soon.